(4) To what extent are Congressional primaries driving this turnout ? For the Democrats, not at all, while for the Republicans, it has helped quite a bit. While the Senate primaries are at the top of the ballot, there are also four contested House primaries. 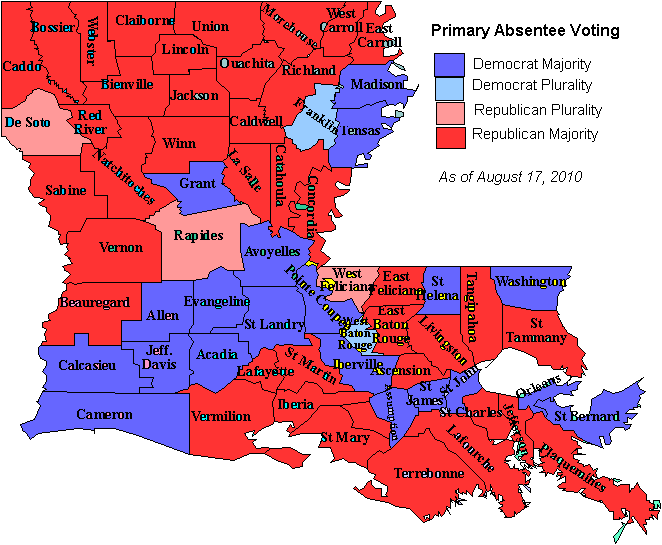 Democrats are holding Congressional primaries in the 2nd Congressional District (most of New Orleans and the Westbank) and 4th Congressional District (northwest Louisiana). Republican primaries are in the 3rd Congressional District (“Bayou country” between New Iberia and St Bernard Parish) and 5th Congressional District (northeast and central Louisiana). When we looked at the parishes where the Democratic Congressional primaries are being held, we noticed that 0.25% of Democrats/Independents early voted, which is about the statewide average of 0.26%. If we look at the parishes where Republican Congressional primaries are being held, we find that 1.24% have early voted, compared to a statewide average of 0.86%. In other words, even with a hotly contested Democratic primary in New Orleans, Republicans are even more enthusiastic about their House candidates where there are serously contested races. Finally, there are a couple of things about early voting that need to be noted: (1) early voting is usually heaviest on the first and last days, and we are therefore not expecting the volume of early voting to increase until the last day; (2) we are making somewhat of a big deal about the early vote volume, because when the Legislature essentially established “no fault” early voting several years ago, more and more people are choosing to early vote, so a constituency of 5-15% of the vote is something a politician would be foolish to ignore – especially in a closely contested race; (3) these numbers are the ones that are typically reported on the TV screen several minutes after polls close at 8 PM.